This review is of the cut shown at the BFI London Film Festival in October 2017 – the UK release date is currently listed for January 19th 2018. It’s a slight shame that Alexander Payne’s Downsizing has turned out to be as divisive with critics as it has been. This has been a project that the Academy Award-winning filmmaker has wanted to make for years, and at one point it was even going to be his next film after Sideways, before he eventually decided to do both The Descendants and Nebraska instead. The fact that the script has been waiting to be made for so long and now has been given the opportunity to do so makes this a rather special passion project for Payne and co-writer Jim Taylor, and there’s no denying that the passion and certainly the ambition is definitely there on-screen. The problem is, however, that it never fully settles on what it’s actually trying to say, or even with what kind of ideas it wants to explore, which is strange because the central idea is one that should open up several possibilities, yet it goes in a completely different and not as inviting direction than audiences perhaps wanted to follow. We start in the near future where a Norwegian scientist (Rolf Lassgård) has come up with a revolutionary way to prevent overpopulation and further damage to the environment: by shrinking people down to the size of a thimble and then placing them in their own customised living spaces. Ten years later, the procedure known as “downsizing” has really caught on, and married couple Paul (Matt Damon) and Audrey (Kristen Wiig) decide to undergo it themselves, as it will mean a much nicer way of life as well as extra profits due to ordinary bank balances being tripled in size as a result. Paul is successfully miniaturised, but only afterwards does he learn that Audrey backed out at the last minute, leaving him alone in his downsized utopia. That sets up the second half of the film, details of which won’t be gone much into here, but what I can tell you is that all of the possibilities you may be conjuring up in your head, get ready to be somewhat disappointed because chances are that none of them will be further explored. Downsizing is really two films in one, and it’s not too hard to guess which one is the more fascinating of the two. During this first half, we get to see how this procedure is operated, what kind of effect it has on the world as we know it, and even raising some ethical debates on whether it’s actually the best thing for the economy or not. This is where the film really does work, as Payne allows us to explore this very intriguing scientific breakthrough and the actual implications it can have on the life of a completely normal person. The procedure itself is so detailed that watching it actually unfold is almost a magical dance of whimsy and delight, and you really want to know more about this world that has been designed exclusively for shrunken folk, because it resembles the kind of paradise that one can only imagine living in, filled with all sorts of luxurious homes and facilities which are pure wish fulfilment. It’s also where the satire is much more evident, and you can get a glimpse of what Payne was trying to say with this overall idea. However, once it gets into the second half of the film, it appears to abandon any of those ideas in favour of something a bit dourer and not at all what was seemingly promised to us by either the trailers or the actual logline. The direction it takes, as well as some of the characters it introduces, in this second half makes the whole concept of shrinking down to an inch of their original size feel completely arbitrary, and may as well have not even been included at the start if it wasn’t really going to lead anywhere. There’s little mention of the concept at all as the film takes on a much darker and depressing angle, and it doesn’t fit in well with the lighter sense of comedy it provides as well, because tonally they’re so far apart from one another that bringing them together just doesn’t make it complete as a whole. There’s also a character that takes on a significant supporting role in this second half that I could tell while watching is going to provide the film’s biggest divide with audiences. Hong Chau, a Thai-American actress, plays a one-legged Vietnamese protestor-turned-cleaner named Ngoc Lan Tren, who speaks in higher-pitched broken English and is a source for a lot of the comedic moments in this part of the film. I can definitely see people reacting with offense at how this character is portrayed in such a stereotypical way, sort of like a less annoying version of Short Round from Indiana Jones and the Temple of Doom, but at the same time Chau is really good at making you feel for the character even when she’s been told to act this way by her director. There are going to be lots of people that have split opinions about this movie, and I predict that this character, and the way she is portrayed, is going to be one of the most hotly debated parts of it, and I can honestly understand either side of the argument. I can’t say that Downsizing is an awful film, as there is clear passion and ambition on display whenever the film actually focuses on the main sci-fi project, but that’s just the thing: its lack of focus makes it appear to be rather short-sighted. 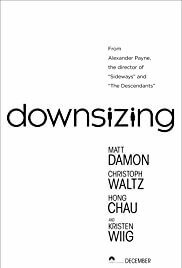 Downsizing is a bizarrely uneven project that definitely shows signs of passion and ambition in its first half, but then takes a very different path which adds up to something rather unfocused and sadly not as fleshed out as it could have been.